I have a present for you in the form of a review of another blog from the November 2011 update to the Social Flooring Index. Check out Mannington's At Home Blog. The At Home Blog was launched on February 15, 2011. Per the official inaugural blog post, "We hope to keep our topics interesting and centered around what’s important in your life: having a beautiful home; a place that makes you happy and gives you comfort; and spreading that happiness to others by “doing good” outside of your own house." New blog articles are published approximately three times per month and address design, flooring, sustainable, decorating and community categories. I really like that the categories appear as menu tabs. The At Home Blog sidebar includes a word cloud which is a visual way to represent the most common terms appearing in blog articles. The word cloud also makes it very engaging to go explore. You'll find links to the Mannington YouTube Channel, Facebook Fan page [with 586 fans] and Twitter profile [which is protected - not sure why]. Blog articles offer a great deal of design inspiration, including marvelous whimsy [see We're Suckers for Popsicle Brights - me, too!] and great juxtaposition of inspiration with Mannington flooring product images [see Bloomin' Color!]. Add subscription options so readers can easily sign up for updates to new blog articles. Let me know who's writing! The 'contact' button generates an email to Betsy Amoroso, director of corporate communications. Why not include a photo, a name and a brief bio? It's much more engaging. Mannington, your blog definitely makes me feel at home! I look forward to reading more! 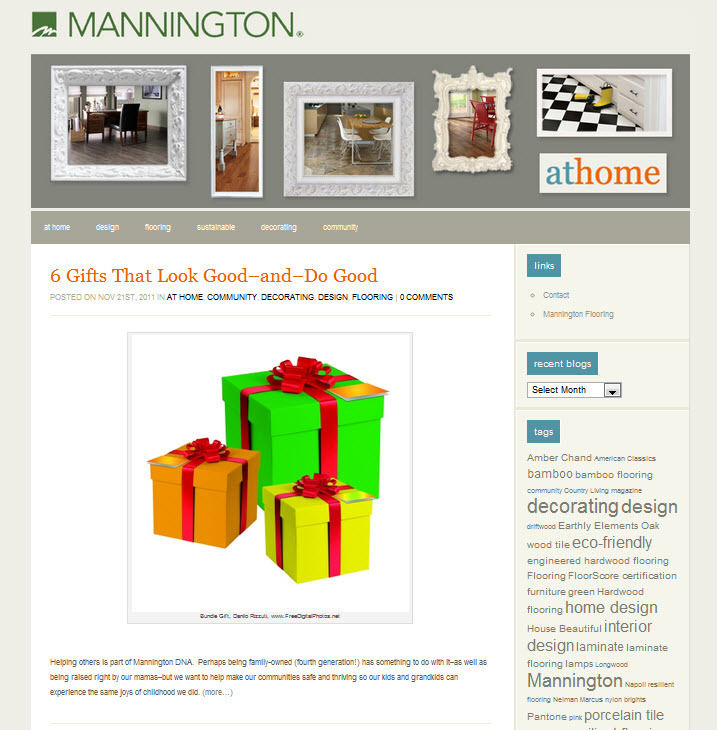 What do you like most about Mannington's At Home Blog?